Every kid needs a cool place to sit. Here are some unconventional seating choices for parents to consider if you are looking for some creative chairs this Christmas. This ‘puppy’ was created by Eero Aarino. 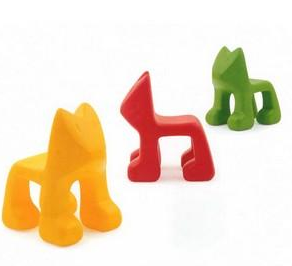 This abstract plastic dog is constructed of hard polyethylene, that is suitable for indoor or outdoor use. 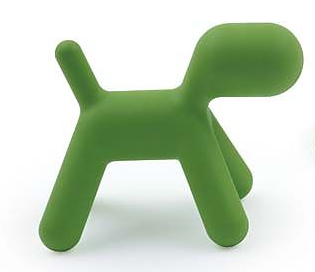 Puppy could be a sculpture, a toy or a small stool, whatever your imagination wants it to be. It comes in 4 sizes and 3 colors. These Puppies are suitable for outdoor use. For ages seven and up. small – $58, Med – $98, Lrg – $132 and XL – $396. The ‘Julian Chair’ was created by Designer Javier Mariscal. 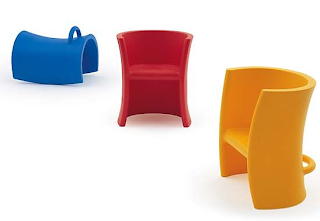 It is an instant classic in this molded polyethylene chair for kids and is suitable for outdoor use. It is great for kids to play on and around. Julian can function as a chair or playtoy, inside or out. Trioli Chair is also designed by Eero Aarnio. It is made from rotational-molded polyethylene and has three different seat heights depending upon placement. This chair’s function depends on its orientation. 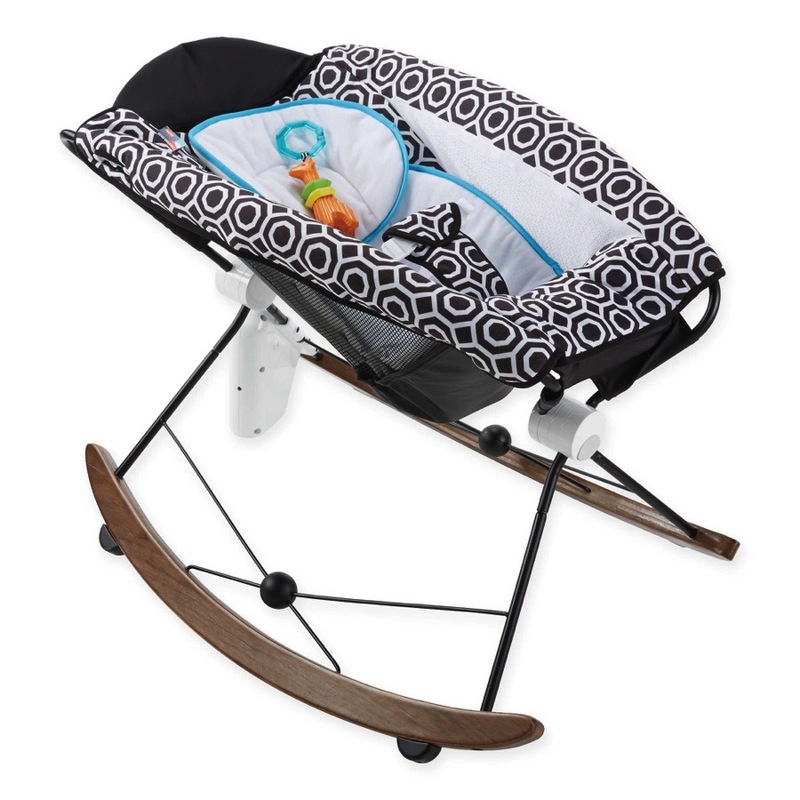 It can be used a rocker if placed on its side. Suitable for outdoor use. Comes in red, blue and yellow for $195. Cubino Chair from Monte Designs. This fun bright chair is made of thick and durable foam covered with a soft polyester canvas. Sturdy and comfortable, it has modern two-tone colour choices, a removable seat cushion, and completely removable and machine washable covers. 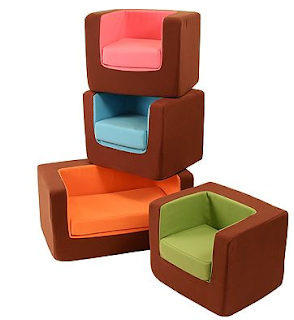 Kids will love this comfortable fun chair is great for lounging and watching television. Chair ($99) and loveseat ($129) available. Recommended for ages 18 months to 7 years. IKEA PS LÖMSK. 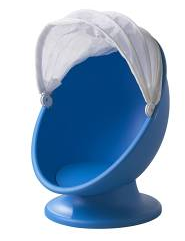 This ‘egg’ as I like to call it is a fun chair and playspace for kids. With the hood pulled down the chair is a secret hiding place for a child. The fabric lets light in so it is never completely dark under the hood. Spinning helps the brain sort sensory impressions. A cushion or pad for added comfort. Available in blue/white and orange/red for $89.